We are embarking on our final SJS session of the academic year. On Sunday, May 31st, we will say goodbye to another school year. The 10th Graders will share reflections, we will take pictures, our teens will raise money for Tzedakah with the annual AMUSY Car Wash ($10 to have your car washed), we will install a new AMUSY Board, we will thank the outgoing AMUSY Board, we will hand out report cards, share in some ice cream sundaes and have our bi-annual Chugim Presentation. 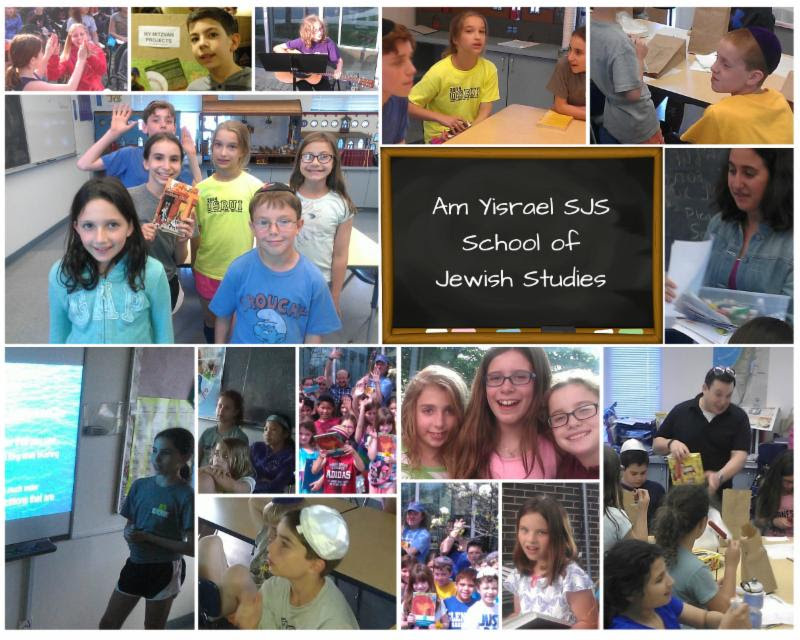 I am so grateful to our wonderful Am Yisrael community for all that everyone put in to making this a fantastic year. Our number of students reached an all-time high during my time as School Director and we have seen so many students progress in their Hebrew skills and/or ability to see the world through a “Jewish lens”. I am also grateful to the educators who demonstrated creativity and pushed the envelope to get our students to reach their potential. Let’s try to fill the bins in the synagogue lobby and SJS lobby with the items that our friends at the Ark desperately need, as the summer months are so incredibly difficult for them. The SJS year moves into Week 33 on a real high note, following our Musical Drama Chug presentation. The collage above features some pictures of students who acted and sang their hearts out in this production! Speaking of singing, Nava Tehila will be with us this Sunday morning, May 24th from 10:00 a.m.-11:30 a.m. for a very family-friendly Shavuot experience. Nava Tehila, based in Jerusalem, have inspired many of our recent musical updates to our services from our youngest kid’s Tefillot (prayer services) to our clergy-led services in the Main Sanctuary. Our bins in the SJS and synagogue lobbies were overflowing with jam, cereals, canned vegetables, canned fruits, canned salmon and dry and vegetarian baked beans this past week. If we can do the same thing on either Sunday, May 24th, Wednesday, May 27th and/or Sunday, May 31st, we will continue to make a HUGE difference. The lessons it teaches our children are amongst the most important ones that they can learn from us. Please be sure to check out the Class Updates this week, as they are your best ticket to seeing what is being covered in our classes and prompts discussions at home. 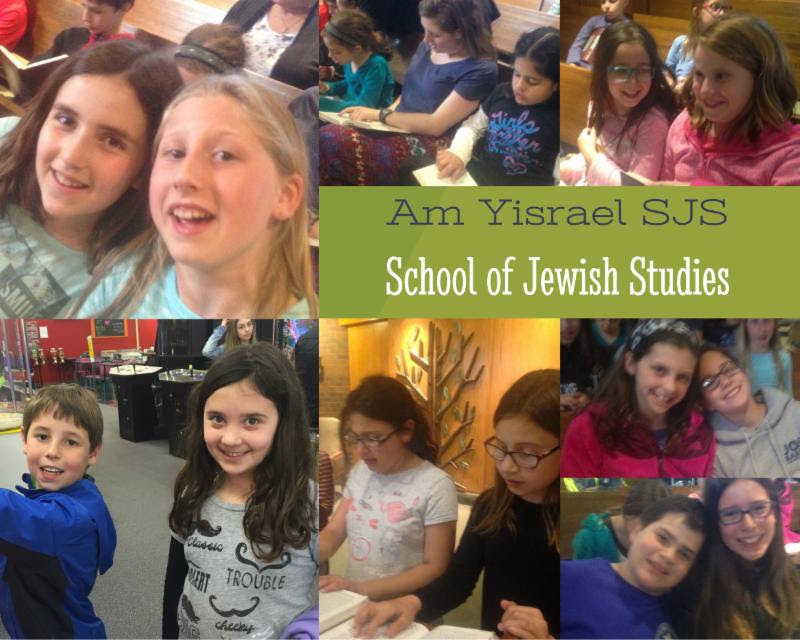 These Class Updates also promote show the high emphasis we put on the learning/enjoyment process at SJS to your friends/families who are looking for a “cutting-edge” synagogue/congregational school for their child(ren)’s Jewish Education. Finally, Mazal Tov to Gabi Froum on becoming a Bat Mitzvah, as she will be called to the Torah this Shabbat. Mazal Tov to Gabrielle’s parents, Aryn and Ted Froum and to her brother Sammy and their entire family! Shabbat Shalom and Chag Sameach! On Sunday, May 24th we will be having a special program with Nava Tehila from 10:00 a.m.-11:30 a.m. to honor Shavuot and the celebration of Torah with over 30 student and Madrichim Torah readers. The original SJS calendar states that SJS begins at the regular time, however we will not begin this special program until 10:00 a.m. We truly hope to see all SJS students and their families on May 24th. 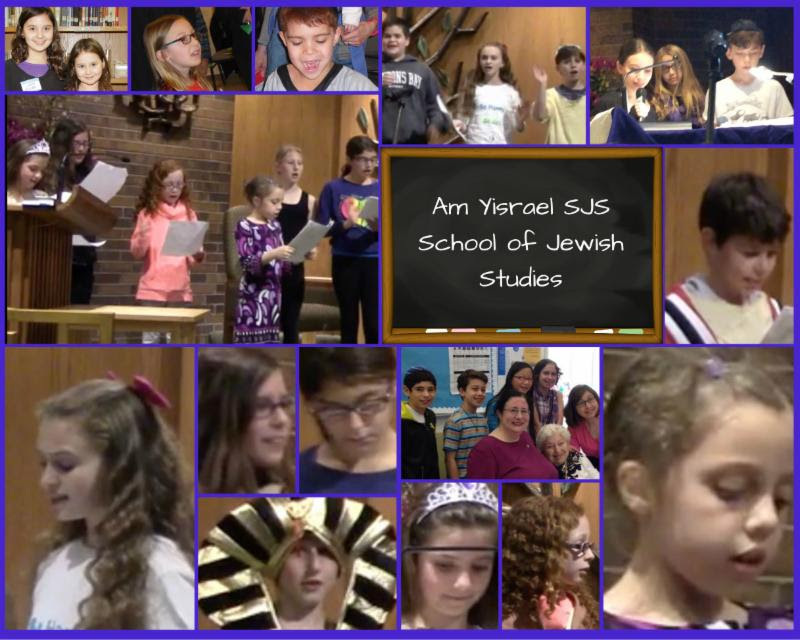 This evening we will begin a new tradition at Am Yisrael SJS. We will be honoring our graduating High School Seniors who have remained a part of our School of Jewish Studies through their Senior year through our Madrichim program. This year twelve seniors in High School are on our Madrichim staff, and as part of this program take a class that is taught half of the weeks by Rabbi Newman Kamin and the other half by Cantor Simon. Mazal Tov to the following students and their families: Jessica Bleiweis, Elliott Cohen, Dana Dolinko, Frieda Greenthal, Eddie Hocman, Ari Jacobson, Ben Klein, Sarah Nadler, Sarah Piell, Liza Salberg, Jordan Schiff and Josh Sussman. You have contributed to our community in a profound way and we and incredibly grateful to you! Finally, Mazal Tov to Henry Mann on becoming a Bar Mitzvah, as he will be called to the Torah this Shabbat afternoon. Mazal Tov to Henry’s parents, Lisa Mann and Rob Mann and to his sister, Lyla and to his brother Ryan and their entire family! Shabbat Shalom! 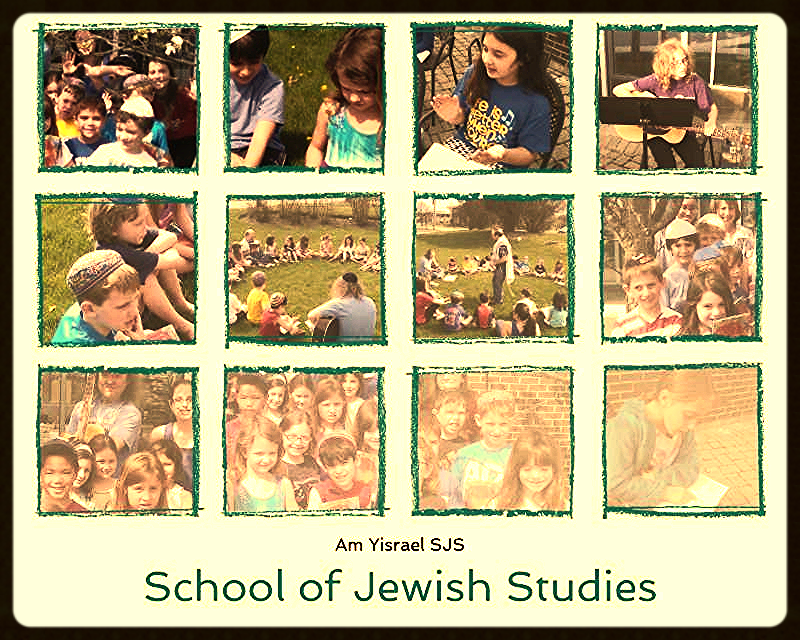 We were so fortunate this past week to get beautiful weather when SJS was in session. This led to some quality time outside during both formal and informal learning sessions. Creating associations of reciting Tefillah outdoors brings me back to my days as a camper and counselor at Camp Ramah. I can truly say that to this day, my reciting Kabbalat Shabbat outdoors with my friends is one of the main reasons that I fell in love with Judaism. 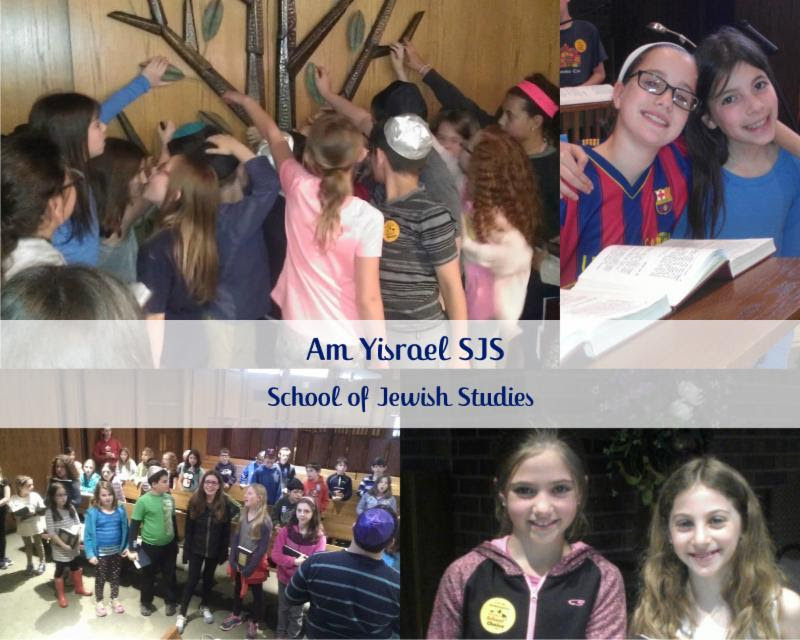 May these memories that we create at Am Yisrael carry those kind of positive memories for our SJS students! Please be sure to check out the Class Updates this week, as they are your best ticket to seeing what is being covered in our classes and often include a parent prompt to encourage discussion at home. Finally, Mazal Tov to Adina Grossman on becoming a Bat Mitzvah, as she will be called to the Torah this Shabbat. Mazal Tov to Adina’s parents, Amy Schiffman and Joel Grossman and to her brother Joshua and their entire family! Shabbat Shalom! 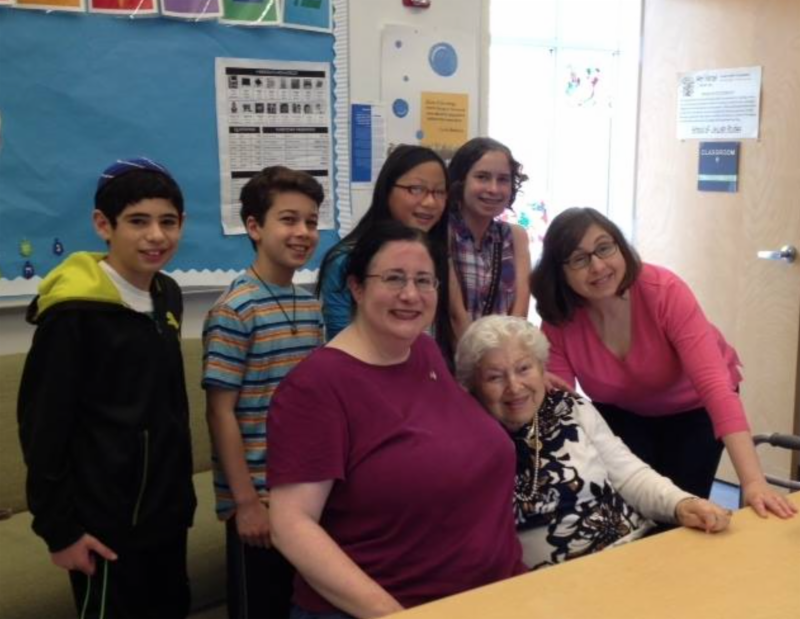 Several Vav students and their Madrichim got to meet with a Holocaust Survivor this past Sunday. Everyone who attended was thoroughly inspired. The program was moderated by Miss Statland. My message this week is all about very important logistics. Please take a few minutes to read it so that we will be on the same page for the many details you need to know for this week: (1) The Heh Class helps lead Friday evening services at 6:30 p.m. today. Following the service, they will perform the Heh Cantata, a Summary of Jewish History. Heh students should arrive promptly, wearing blue and white Shabbat attire. (2) REMINDER: (a) SJS for Gan through Zayin students this Sunday goes from 9:15 a.m.-11:00 a.m; (b) SJS for Prozdor through Confirmation: 10:00 a.m.-11:00 a.m. (c) DROP OFF AND PICK UP AT AM YISRAEL. (3) On Sunday, May 3rd, please wear either blue and white clothing or Israel themed (Hebrew writing, Israeli army, etc.) shirts to support Israel Solidarity Day. (4) We will be celebrating with the Chicago Jewish Community at Ravinia immediately following SJS. (5) Highlights at Israel Solidarity Day will include: (a) Rick Recht Concert (best for children 5 and under); (b) Jamman Drum Circle; (c) The Maccabeats; (d) Three Mile or One Mile Walk; (e) Hadag Nahash; (f) Children/Teen Activities; (g) GaGa Tournament. For more information, please click here. (6) “SJS‘ ZayinDrive”: “And if your brother becomes poor and is not able to make a living, then you are to help him to survive…” Leviticus 25:35. Many people today aren’t as fortunate as us, and can’t afford food or clothes. The Zayin Class is proud to say, that in continuation of our B’nai Mitzvah, we are leading end of the SJS year collections. During the summer months, there is ongoing heavy use of the Ark’s kosher food pantry by the impoverished and needy in the local Jewish community. Since Jewish school contributions do not occur during the summer months, we are conducting an end of the school year drive to help stock the pantry. Individual classes are being assigned to bring especially needed kosher items. 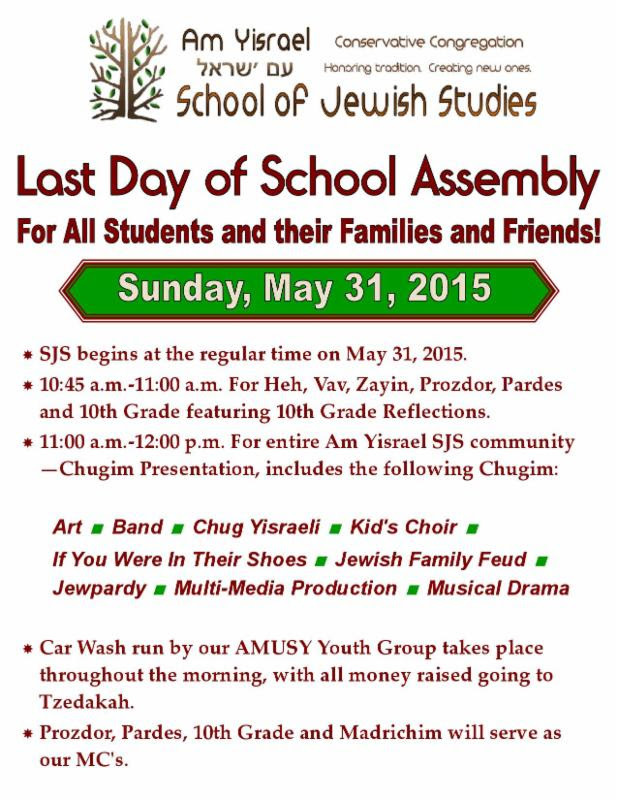 Your assistance and generosity in the Am Yisrael School of Jewish Studies food drive will be greatly appreciated. (7) As you engage with your children about their Jewish Studies, please be sure to check out the Class Home pages this week. Last, but certainly not least, Mazal Tov to Eli Levy on becoming a Bar Mitzvah and Maya Levy on becoming a Bat Mitzvah, as they will both be called to the Torah this Shabbat. Mazal Tov to their parents, Julie and Alan Levy and their entire family. Shabbat Shalom!